Warren Zevon was one heck of a great songwriter and musician. Asbestos got into his lungs and took him out way too soon in 2003. But Warren managed to release what I feel is some of his best albums just a few years before he croaked. 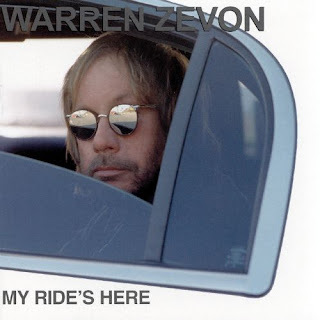 The Krude approved album in question for this blog is the 2002 Zevon classic My Ride's Here. Zevon purists will most likely disagree with my assessment of this album. Most of his fans come from the 70's and early 80's era of his recorded output. But My Ride's Here is a very cool album that grabs your attention right off the bat with the guitar driven tunes Sacrificial Lambs and Basket Case. Most of Zevon's albums have him playing piano driven tunes to open with. But the crunch of the guitars that open MRH sets the tone for this great album. I don't think Zevon knew in 2001 when he was recording this album that he would be dead in two years.But his popularity was waning and it shows in his songwriting here.The overall tone of this album is dark.And literate. As usual with Zevon. The WZ albums before and after this one Life'll Kill You and The Wind were great. But My Ride's Here holds a special place in Krude's Kranium. Some rock. Some Irish style. Some trippy. Some anthems. Some piano. Zevon put it all into this album. And he managed to get David Letterman and Hunter S Thompson into the mix as well. Letterman supplies the line "Hit Somebody!" during Hit Somebody. And HST co-wrote You're A Whole Different Person When You're Scared. Great tunes. Not for average Luke Bryan fan. That's for sure. I was listening to this album on the way to work recently and realized it's been 15 years since it's been released. It seems like it was longer than that. Maybe cuz Zevon had been around since the 1960's making music. And it's that time of year that NHL hockey starts and Hit Somebody could be the greatest hockey anthem of all time. Crank it!